It’s official! Winter has officially avoided the entire state of Oregon! Unfortunately, it’s also possible that the state of California and Washington may be facing the same fate. I never thought that I would be regretting purchasing my annual snow park pass. However, at least I never had my snow tires installed. Nothing worse that driving around on some meaty snow tires inside the urban jungle and getting even worse gas mileage. However, I haven’t totally given up hope. We’ve had some pretty late storm surges during the months of March in the past decade or so and maybe we are heading towards it again. If not, we are doomed to face the fate of Southern California and maybe even worse. I still have faith that the great state that is known for it’s heavy rain totals and mucky reputation will once again bask us in the glory of some heavy snow with scary rainy weather along the valley’s below. I do though, will never take up snow dancing again since I’ve worn out my snow dancing shoes and must now just put my faith in mother nature to remember how beautiful the Cascade mountains looks after an abundance of snow has draped it’s peaks. [/caption] Trillium Lake normally freezes over during the winter months and allows snow-shoers, x-country skiers and the occasional ice fisherman to take advantage of the winter paradise! This photo was taken from the north side of the lake with Mt. Hood behind me. I took this shot at about 2:25pm and as you can see the sun was included in this photo in order to brighten the photo as much as possible without allowing too much glare to ruin the shot. In order to avoid this I made sure to attach my CIR-PL and set the ISO at 100 and reduced the white balance to -0.7. I was hoping to increase the brightness and reduce the saturation surrounding the trees but due to the snow, I was limited in my attempt to have each tree stand out more. I had the camera in Normal/Program mode so the aperture was at F-10 and the shutter speed at 1/400 second. I ended up increasing the brightness on my Adobe Photoshop to 25 since the color of the sky was over saturated and the trees were barely noticeable. I was using my Sigma 17-70mm lens and kept the focal length at 17mm in order to get the most panoramic photo as possible. [/caption] Beautiful sunny afternoon after a huge snow storm blanketed the Cascades with fresh powder. 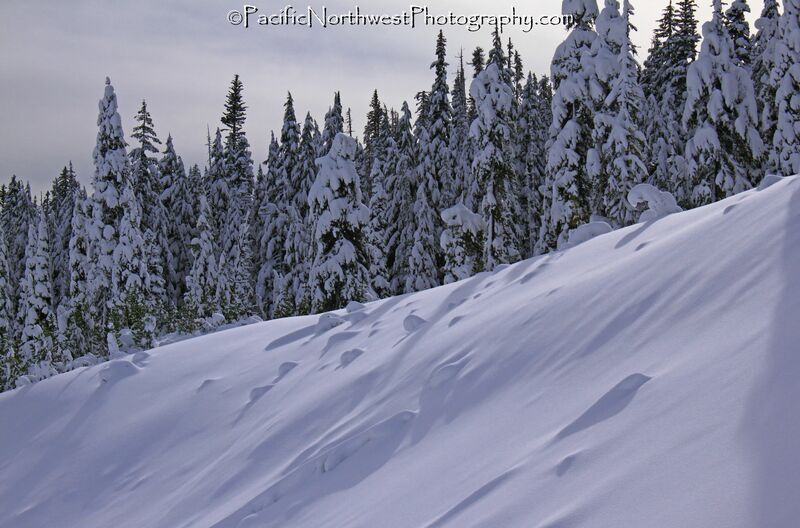 A great time to head out into the Cascades is just after a huge snow storm covers the forest with fresh powder. You will want to make sure that you bring some snow-shoes or cross country skis if you want to take advantage of the solitude that the forest offers. I usually don’t bring a tripod with me since it can really weigh me down and cause me to lose valuable time while photographing the area. However, sometimes I will bring it along just in case I need it or if I don’t have too much gear with me. I’ve learned that you don’t have to bring along a tripod if the skies are completely clear and the sun is at it’s highest point. However, once the clouds come over and the light starts to decrease, you are pretty much done for the day unless you plan on increasing your ISO, turn on your IS and increase the white balance. I can especially get more creative whenever I’m not attached to my tripod while snow-shoeing since I can get into some really precarious positions in order to get the best photo. Attaching your CIR-PL also allows you to saturate the sky no matter if it’s blue or overcast. You just want to make sure that you always check your histogram after every shot to ensure that it’s not too over saturated or over exposed. The snow can cause your shot to be either over exposed or under exposed so you want to make sure that you review each shot that you take and then adjust your settings accordingly. This will allow you to delete the bad ones and ensure that you only keep the very best. I’ve also learned that you will want to invest in a front camera harness so you can protect your camera from the elements as well as give you quick access to your camera without having to take off your camera bag every time you want to take a shot. Sometimes I don’t even bring my poles, which can slow me down when I’m grabbing for my camera. [/caption] Mt. Hood is normally covered in the white stuff from November until around April and sometimes even until May. It usually depends on the length of the rainy season and temperatures in the higher elevations. This photo clearly shows just how much snow Mt. Hood gets in winter. This photo was taken from the west and Timberline lodge and it’s ski lifts are just below the photo but not in the shot. For the best opportunities to get some great shots, of a completely snow covered mountain, I would visit during January or February since the weather is cold and you’re guaranteed to see some snow falling or at least get the chance to see the Cascades with lots of blue sky just after a massive snow storm hit. However, since it gets dark early and the clouds usually return by late afternoon, I would plan on getting up early in the morning and on the trail just as the sun starts to rise over the mountains. The morning is the absolute best time to get your best photos and have a chance to catch the blue skies over the mountains. [/caption] If you haven’t been watching the snow report, along the Pacific Northwest recently, you probably aren’t aware that Mt. Bachelor received 35 inches of snow yesterday and Mt. Hood received over 4 feet of snow over the last two days. And that’s just in Oregon. Washington state has been reporting historic epic snow falls since they’ve been keeping records. The next 2 weeks is looking like more historical amounts of snow in the Cascade mountains. Now is the time to dust of your snow-shoes or cross-country skis and head up to the snow parks that line the Cascade mountain range. Make sure to bring your snow shovel and don’t forget you GPS and survival gear. This is shaping up to be one of the most amazing winters yet in the Pacific Northwest. [/caption] Trillium lake offers a great place to view snow-capped Mt. Hood just after a snow storm. The lake is about 2 miles from the Trillium lake snow-park and it will take you about an hour to snow-show but even less time if you’re x-country skiing. There are several areas where you can explore and you may even spot some wildlife along the way or near the lake. The best times to visit is either during mid winter, after a big snow storm, or during Spring, when there is still plenty of snow on the mountain and the skies are clear. The lake can get pretty crowded during the summer months so I would try to visit on a weekday. There is an endless amount of trails beckoning you once you’ve reached the lake. You could spend days or weeks exploring the Mt. Hood National Forest if time and weather permits. [/caption] Winter is officially here and he Pacific Northwest is experiencing some of the heaviest snow fall in the Cascade mountains. That also means lots of rain in the valley’s of Puget Sound and the Willamette Valley. So, dust off your x-country skis and snow-shoes and plan on getting out there and experiencing some of the best days of your life. What’s better than burning some serious calories, getting an awesome leg burn, enjoying some peace and serenity and witnessing some of the most beautiful scenery on the planet. This photo was taken just east of Mt. Hood after a recent snow storm. I was on a snow shoe adventure and noticed that all of the trees were flocked like Christmas trees. A great post card setting for sure. [/caption] There is nothing more beautiful than looking at a blue sky looming over a mountain covered in snow. The spring flowers are blooming in the lower foothills so it’s feeling a lot like spring in the Willamette Valley with the rainy and warmer temperature’s but not so much in the Cascades. This is the best time to enjoy some serious snow storms along the Cascade mountains. March is usually the snowiest month of the year which allows the mountain chain to collect its largest amount of snow. Spring also brings the warmer temperatures in the mountains so you don’t have to bundle up as much, the days are longer and you’re more likely to see some sunny skies after a big snow storm. I was using my Tokina 12-24mm wide angle lens to get this shot. I wanted to have as much of the mountain in the field of view so I set the focal length at 24mm. The field of view was still pretty high so the entire landscape is in focus. The camera mode was in Program/Normal mode so the aperture was set at F-10 and the shutter speed was at 1/200 second. This photo was taken at 11:40am and the sun was very bright and intense. 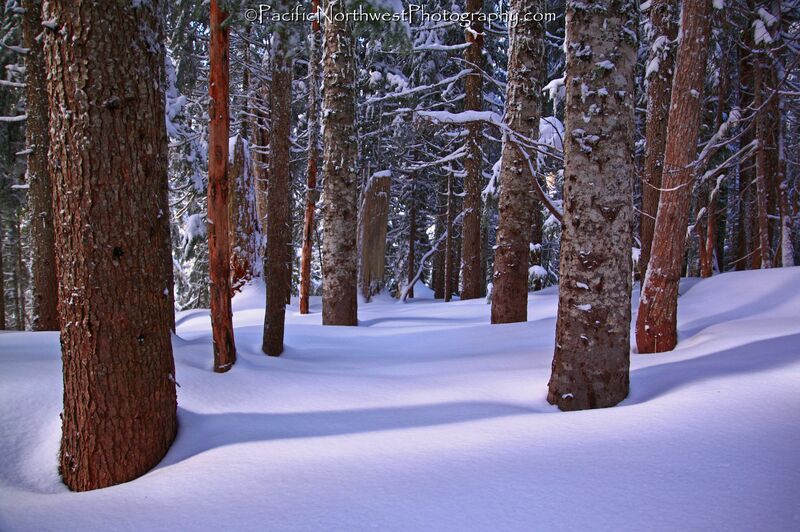 I stood in the shadow’s of the tall trees in order to avoid any glare in the foreground. The shadows in the foreground helps draw the viewer to the mountain as well as the snowy landscape in the distance. I also set the ISO to 100 and the white balance to -0.3 so the mountain wouldn’t be overexposed. I also attached my warming filter and my CIR-PL. [/caption] A snow storm that had brought 6 inches along the Mt. Hood Wilderness the night before gave way to sunny skies the morning I took this photo. This makes for an epic day since the sun creates a fantastic contrast, flocked trees create a great personality and the blue skies allow the mountain to really stand out. I normally stop hear whenever I am heading out on a snow-shoe trip during winter or a hike in the summer. This photo shows just how well your photos can turn out if you have all of these ingredients. The sun was still fairly low so parts of the trees are shrouded in the shadows. This also creates more personality in your field of view. I also made sure to crop out some of the sky high above as well as parts of the trees in the foreground. I wanted to showcase more of the snowy mountain in a panoramic view. I took this photo on 2/9/11 at about 10:23am and I had stopped along Hwy 26 to take this shot. I wasn’t using my tripod or my remote switch since the lighting was pretty good and I wasn’t worried about any blur or camera shake. However, I did make sure that the IS was on. I was using my Canon T1i along with my Canon 55-250mm telephoto lens. I also attached my warming filter and my CIR-PL in order to take advantage of the blue sky and bring out the colors of the flocked trees. I had the camera in Program/Normal mode so the aperture was set at F-8 and the shutter at 1/250 second. Due to the brightness of the sky, snow and sunlight I did set the ISO to 100 and the white balance to -0.7. I also set the focal length to 60mm since I wanted to avoid photographing the Hwy below as well as eliminating some of the sky. Therefore, I was able to include the entire mountain without having too many distractions in the frame. I’ve taken hundreds of photos from this same spot which includes many different types of panoramic to close up shots of the mountain but this allowed me to showcase the entire volcano.